Heritage Counts2006, compiled by the Yorkshire and Humber Historic Environment Forum (HEF) revealed that more than 65% of people in the region visited a historic venue in 2005/06. It also found that more people than ever entered into the spirit of September's Heritage Open Days, in which 350 properties across the region took part. One notable success was the Bath House, sometimes known as Gipton Spa or Waddington's Bath, in Gledhow, Leeds. It was reopened thanks to the efforts of Friends of Gledhow Valley Woods, who cleared the undergrowth and now hope to fully restore the 300-year-old attraction. 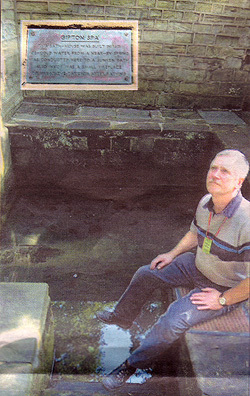 The Gayle Mill Trust, near Hawes, Wensleydale, was also praised. Local people helped in the £1m revamp of the nation's oldest structurally unaltered cotton mill dating from 1776. Maddy Jago, from English Heritage and the HEF, said "The report suggests that heritage projects are well backed by local communities. But they need support. Either through funding, encouragement or the provision of expertise and training." The document looks at progress in protecting and promoting historical sites, while highlighting the trends and challenges facing the Yorkshire region. As part of the campaign, 46,000 people 'made history' on October 17 by contributing to a blog diary recording what they did on that day. This unique picture of the nation will be recorded at the British Library. The report also highlights the people of Corwood, North Yorkshire, who have formed a community group, backed by £22,000 from the Heritage Lottery Fund, to uncover the village's little-known heritage. In total, 129 Grade I and II listed buildings and scheduled ancient monuments feature on the 2006 Buildings at Risk Register - including 33 in West Yorkshire. More information about the opening of Gipton Spa Bath House for Leeds Heritage Open Days, together with photographs from the events, can be found in the Events Gallery section. You can also learn more about the history of Gipton Spa in the About the Woods section. If you come across any articles in newspapers or magazines which relate to the Friends of Gledhow Valley Woods, or to the woods in general, please contact us so we can add them to the site.